Colin and Marios first worked together at Prontaprint in Leicester in 1994 when Marios joined the team in the position of Marketing Manager and worked alongside Colin - who had been with the company for six years in the role of Sales Manager. Colin left the centre five years later to pursue a career as a Regional Manager with Prontaprint Ltd whereas Marios stayed on to become part-owner and General Manager of the centre. In 2004 Colin purchased his own Prontaprint centres in Milton Keynes and Northampton. 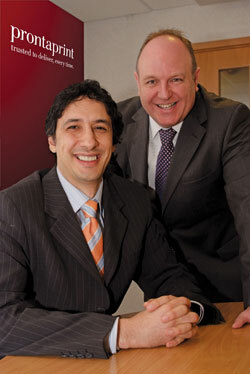 While pursuing individual career paths the duo stayed in touch and when Marios's previous partners at Prontaprint Leicester announced their retirement they took the opportunity to work together again, taking over joint management of all three franchises and combining their years of experience in the industry to form the largest centre group in the Prontaprint network. Now the three centres boast a combined turnover of £2.5 million, national clients including Boots, Vodafone, Unilever and Barclaycard and a dedicated team of over 30 staff.